In it’s simplest terms, the Seal of The Confederate States of America depicts George Washington on horseback, surrounded by the principle crops of The South – tobacco, cotton, rice, sugar cane, corn, and wheat. The outside edge includes the date of the inauguration of Jefferson Davis as President of the C.S.A., and the motto Deo Vindice, which is usually translated as God will vindicate. The story behind the Seal is far more interesting and tells much about life during that period of time. The seal was designed and created by Joseph S. Wyon in London, England. Mr. Wyon’s engraving firm was engravers to Queen Victoria and makers of the Great Seal of England. The actual seal is comprised of a set of embossing dies made of silver which must be placed in its embossing press in order to be used. The embossed image is approximately 3.6 inches in diamater. When the Seal was completed, it was delivered to James Mason, a confidential agent of the Confederacy in England. He selected Lieutenant R.T. Chapman of the Confederate Navy to bring it to America. In order to avoid the naval blockade, Lt. Chapman was forced to take a long and circuitous route. He went form England to Halifax, Nova Scotia, then to the Island of Bermuda and finally to Wilmington, North Carolina. When the Confederate Government evacuated Richmond in April of 1865, Mrs. William J. Bromwell, the wife of an official of the Confederate State Department, smuggled the Seal from the doomed city. Together with an important part of the Confederate archives, the Seal was hidden from Federal forces in a barn near Richmond. It eventually made its way into the Museum of the Confederacy in Richmond, where it can be seen today. The seal shown here was probably never used in any official capacity. The seal plates and the press traveled separately and were never known to have been in the same place at the same time during the Confederate period. The seal that was actually used by the Confederate government was the provisional seal, which consisted of a scroll with the word “Constitution” above, and the word “Liberty” below. After the Confederate government collapsed, Secretary of State, Judah P. Benjamin threw the provisional seal plates into the Savannah River as he fled for England. The embossing press is currently in the custody of the Cox family of Hamilton, Bermuda. The text on the case says, “Original Confederate Seal” and “For presentation to Confederate Government Officials”. This seal is owned by Stephen Clay McGehee. 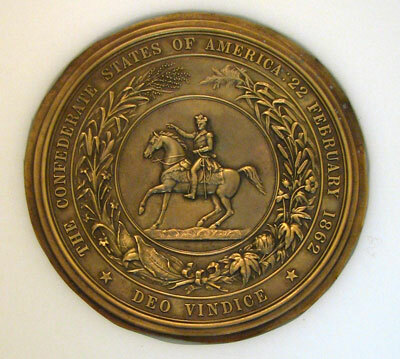 An unknown number of bronze embossings were made from the Confederate Seal. These were embossed onto heavy bronze and then mounted for display. This photo is of one such embossing purchased at an auction. 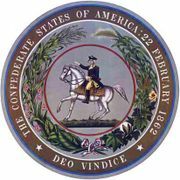 1862 GREAT SEAL OF THE CONFEDERATE STATES OF AMERICA, FEB 22 1862 – DIO VINDICE, BRONZE. Struck by Samuel H. Black, a New York electrotyper in the 1870s using the original confederate seal now on display at The Museum of the Confederacy in Richmond, Virginia. It is believed that only 1,000 pieces were struck and coated with either gold, silver or bronze and sold by John T. Pickett with all generated revenue going to the benefit of Southern widows and orphans of the civil war.